Fracture is a premium Joomla 2.5 Template and also Joomla 3.0 Template. This is a unique Joomla Template because it has a fully Responsive design so that the width will automatically adjust to the viewing screen. The content is dynamic and in an interactive grid structure so it will auto-align. It doesn’t matter if you have different sizes for images or text. Another feature is that this Joomla 2.5/Joomla 3.0 Template supports mobile events such as ‘Swipe’. Click here for more features of Fracture. 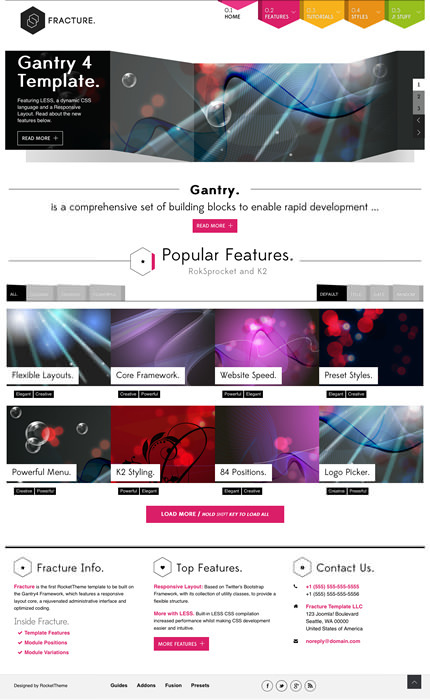 RocketTheme is a premium Joomla 2.5 and Joomla 3.0 Template provider. RocketTheme provides themes to create professional Business Websites, Portfolio Websites, and more.